Star Wars Poker Chip Set – Raise Him 10, Luke | OhGizmo! I’ve said it before and I’ll say it again. If you need a surefire way to sell anything, just find a way to make it Star Wars themed. In this case it’s a Poker set, but I have to admit they’ve actually done a pretty good job with the Star Wars conversion. It features a chrome dealer token that looks like the Death Star, as well as a set of translucent chips illustrated by artist Russell Walks. The set includes 50 blue Luke Skywalker chips, 50 blue Obi-Wan Kenobi chips, 50 green Yoda chips and of course 50 red Darth Vader chips. 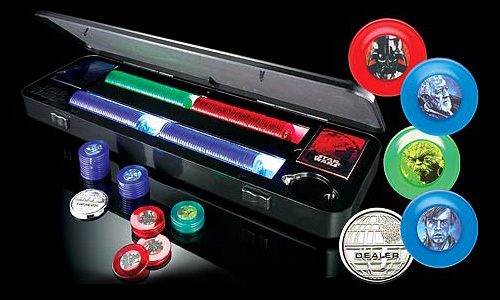 The case even includes 72 LEDs that make the chips glow like lightsabers when they’re stacked in their respective slots. There’s even 2 casino-quality card decks that come in their own foil boxes and I can only assume include custom Star Wars graphics. You can find it at the Sharper Image for $149.95. Ok. I’m a geek, a tech freak, a gizmo hound and a poker player. I find myself wondering if the line to cross wasn’t back there somewhere . . . There is a Sharper Image closing down near my home. I was able to get the set for $35.00!